Alberto here. The female human ordered a huge heavy walking machine (she calls it a treadmill) recently and The Tribe of Five watched with interest as she and the male human put this monstrosity together. Our snoopervising duties did not end when the thing was assembled, nope, that’s when our work really began. Having done these duties for a month now, Oliver and I thought we’d share this manual with our other feline friends who have humans who use these machines. The human must move the rug in order to place a thing she calls a mat on the floor. Lacking opposable thumbs, I am limited in what I can help with but I do make sure she has moved the rug over correctly. To indicate my approval, I will sit on the folded carpet. The human then takes a long rubber thing she calls a “mat” out of the closet and sets it down on the bare floor. Oliver’s job is to make sure the mat thingy is placed correctly and that it hasn’t lost any of its softness. Once Oliver stops rolling on the mat, the human may then remove him for the next step. Once Oliver is removed from the mat, the human rolls the big walking machine over and prepares to lower the bottom half. Once the machine is placed purrfectly, Oliver does a quick walk-around and indicates when he is satisfied that the placement is correct. After Oliver has given a “paws up” to placement, the human lowers the moving part of the machine. It is then my job to carefully observe all areas of said machine before we allow the human to get on it. After all feline inspection is completed indicate to your human that the machine may now be used. This indication may take many forms; we prefer stretching out across the length of the machine as our signal. you may find something more suitable for your household. The human (once she removes us) may then begin the walking procedure. Even though the human is now using the machine, there is still an obligation on behalf of the household felines to stay and make sure the human doesn’t do anything stupid (I mean dangerous). You must remain until the walking is finished. We prefer two observation options, one is under the green chair and the other is as far away from the thing as we can get. When the human finishes she observes something she refers to as “cool down time”. This is when she sits on a chair and breathes heavily. In order to ensure that she does not overdo, you must station yourself on the moving machine until proper cool down time has been observed. Snoopervising is hard work! When all equipment is put away and the rug and the furniture are returned to the proper places. You should then head upstairs and take a 4 or 5 hour snooze to recover. Oliver and I hope these instructions will prove helpful to all our feline friends and their humans with moving machines. If you have any feline snoopervising tips you’d like to add, please give us a meow. 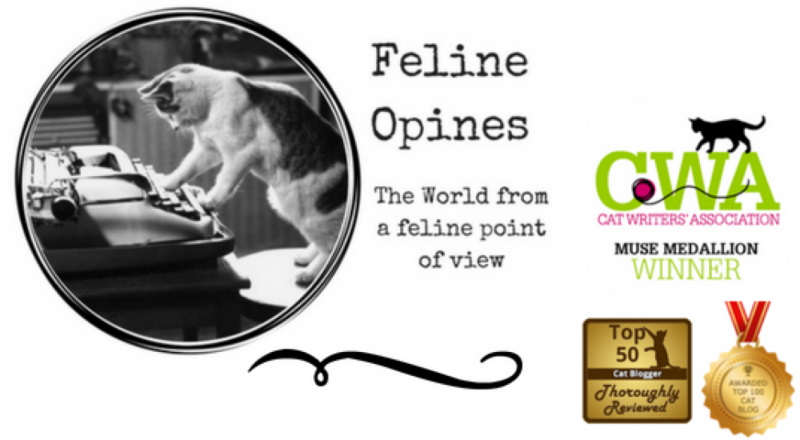 This entry was posted in athlete cats, cat behavior, Cat writers, cats, shelter cats and tagged cats and treadmills by Feline Opines. Bookmark the permalink. What a wonderful, useful, thorough guide ! Thank you, we felines just want to be helpful. That’s some darn good supervising! Our peeps used to have something like that but they finally hung their clothes in the closet MOL! Heh,heh, those humans have some wacky ideas! If they want exercise they could use our automatic red dot machine. I know but our female human is determined and goal oriented, always going faster and longer. MOL humans should be more like felines, just relax and sleep 12 hours a day! I know, those humans would be in a lot of trouble without the snoopervising skills of their felines! Have to make sure everyone is safe and under supervision right? Any thoughts about using it yourselves? We felines maintain our svelte figures without the need of those sweat inducing human machines. Excellent thoughts! I should really convince one of our three cats to read this as he seems to thing that snoopervising means being in the middle of said activity! Well, I must say that being in the middle of a human’s activity actually is part of snoopervising. If humans are reading, working on the computer, doing crafts, etc then a “sit in the middle of everything” approach is called for. You humans would be in dire straits without us felines! These are very interesting snoopervising tips for humans using a machine. We mostly have experience with helping our humans when they do what they call “planking” on the floor. I think they have come to like my particular habit of plonking myself on their buttocks and lay there for a few minutes. Oliver and Alberto, I think you have your human covered and she must be thankful for always helping out. We must talk to our humans about this “planking” thing, it sounds quite intriguing ! I think Oliver and I would be very good at plonking. I’m so glad Alberto and Oliver are there to make sure you use this walking machine correctly. I don’t know what you’d do without them! I’m glad they were there to help! What on earth would you do without such fantastic supervisors?!?!?! It sounds like you have a great system! My cat just walks out of the room when anyone uses the treadmill, shirking all supervision duties. You are all PAWsitively spectacular at your snoopervising activities! You have provided a very thorough guide for felines and canines alike! I wish I had Alberto and Oliver to supervise my work on the Elliptical machine. I would enjoy the company, and my dog won’t go anywhere near it. Keep up the good work! Such great supervisors! Mom Paula has a stationary bicycle, but she hasn’t used it in a couple of years. She used to be afraid she’d hit us in the head with the pedal because we were very curious about it. She said she needs to get back on it because her knee is giving her problems again. This was a fun post to read. The feline are doing a great job supervising the human, cause lets admit it, humans are def not as smart as them! I loved the supervision behind the cushions photo! Oh you kitties. I have not giggled so much in a long time!! We are so glad you keep an eye on your human (they tend to do reckless thinks like jog and cycle too!). Fun article and great job on the “voice of the cat”.I can see this perfectly. Excellent job snoopervising your human! That machine can’t hurt her with you two on duty. Icy and Phoebe are so impressed, and feeling rather inadequate not having any human safety snoopervision tasks to do. That kind of scares me, wondering what they may come up with…..
As much as this feline hates to admit it, I’m thinking purrrhaps a canine snoopervisor might be more helpful, remember Lassie? Wow, it sure looks like you guys have the treadmill routine under control! Your human is lucky to have you guys help out. Thanks for the advice too, in case this is a job we need to undertake in the future. Thank you! We did publish this as a public service to felines and their humans. Those humans really need help!